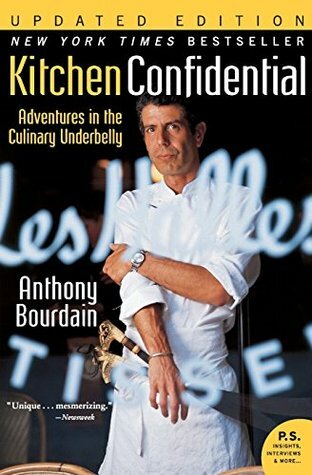 Kitchen Confidential: Adventures in the Culinary Underbelly is a New York Times bestselling non-fiction book written by American chef Anthony Bourdain, first published in 2000. In 1999, Bourdain's essay "Don't Eat Before Reading This" was published in the New Yorker. This served as the foundation for Kitchen Confidential. Released in 2000, the book is both Bourdain's professional memoir and a behind-the-scenes look at restaurant kitchens. The book is known for its treatment of the professional culinary industry, which he describes as an intense, unpleasant, and sometimes hazardous workplace staffed by who he describes as misfits. Bourdain believes that the workplace is not for hobbyists and that anyone entering the industry without a masochistic, irrational dedication to cooking will be deterred. The book alternates between a confessional narrative and an industry commentary, providing insightful and humorous anecdotes on the cooking trade. Bourdain has cited George Orwell's Down and Out in Paris and London (1933), with its behind-the-scenes examination of the restaurant business in 1920s Paris, as an important influence on the book's themes and tone. Bourdain details some of his personal misdeeds and weaknesses, including drug use. He explains how restaurants function economically and warns consumers of the various tricks of restaurateurs. Anthony Michael Bourdain (June 25, 1956 – June 8, 2018) was an American celebrity chef, author, travel documentarian, and television personality who starred in programs focusing on the exploration of international culture, cuisine, and the human condition. He was considered one of the most influential chefs in the world. Bourdain was a 1978 graduate of The Culinary Institute of America and a veteran of a number of professional kitchens in his long career, which included many years spent as executive chef at Brasserie Les Halles in Manhattan. He first became known for his bestselling book Kitchen Confidential: Adventures in the Culinary Underbelly (2000). In 2013, he began a three-season run as a judge on The Taste, and concurrently switched his travelogue programming to CNN to host Anthony Bourdain: Parts Unknown. Though best known for his culinary achievements and television presentations, along with several books on food and cooking and travel adventures, Bourdain also wrote both fiction and historical nonfiction. On June 8, 2018, Bourdain committed suicide while on location in France for Parts Unknown.